Use the Financial Conflict of Interest Report form for all interests required to be disclosed that impact the employment or obligations as an official of an employee with the company. This Financial Conflict of Interest Report is included in editable Word format that can be customized in Word or by using the included Wizard software. How do you write a Financial Conflict of Interest Report document? Use this form for all interests required to be disclosed that impact your employment and/or obligations as an official with Company Name and comply with Insert your State or Company Policy Reference here, or let this stand "as is". This report must be filed annually for all Directors and Officers. Additional sheets may be attached as necessary. 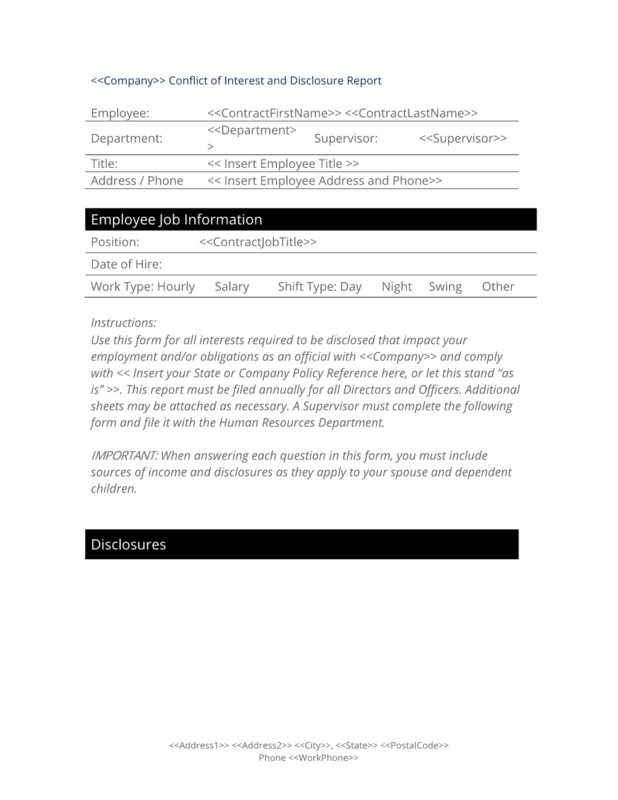 A Supervisor must complete the following form and file it with the Human Resources Department. IMPORTANT: When answering each question in this form, you must include sources of income and disclosures as they apply to your spouse and dependent children. Please list all your sources of income of more than $600 per year. Sources of income to list include salaries, hourly employment, directorships, dividend and investment income, interest payments, annuities or other settlements. Please list any investments in or ownership of public or private corporations, stock or other business organizations that are in excess of $5,000 or constitute a 5% or greater ownership stake. You are not required to list specific amounts of your investments. Instead you should specify, as an example, that you have an investment in "xyz" firm who is in the "abc" industry. Please list any persons, firms, or organizations for whom lobbying, compensated or not, is performed by you or your family members. Please include non-dependent children in your answer for this question. Please list all professional services you or your spouse provide, such as attorney, accountant, or consultant, and the interests that you provide them for as a general overview (e.g., industry, company type, etc. Please list any bankruptcy, default, or discharge of debt received in any United States District Court within the last ten years of the date on this form. Please list all loans or combination of loans that total more than $1,000 from the same source. Private loans made to family or children are not required to be disclosed, provided that you are not a co-signer on an instrument of debt for a loan made to family or children. Please list all other financial disclosures or disclosures of employment, offices or positions held, public service or legislative employment, or any other disclosure you want to make. Employee / Officer Signature Date. The complete Financial Conflict of Interest Report - with the actual formatting and layout - is available in this Contract Pack.